1. What are your current and past projects that you have you done? I am actually working on three series Alexia. The Adventures of Gabriel Celtic, an action/adventure/mystery series featuring (of course) Gabriel Celtic. The first book in the series, ‘Murder! Too Close To Home’, (originally The Ghost Murders) is out as an e-book through Trestle Press, and will be in paperback soon. The second of the series, Gabriel’s Revenge, is written and going through revision. I hope to have it out in a month or two. Pepper and Longstreet is a new YA mystery series that reminds me of the old Hardy Boys and Nancy Drew mysteries…with a paranormal twist! The first volume, ‘The Beginning’, just came out last week, and I’m very excited about this new series. 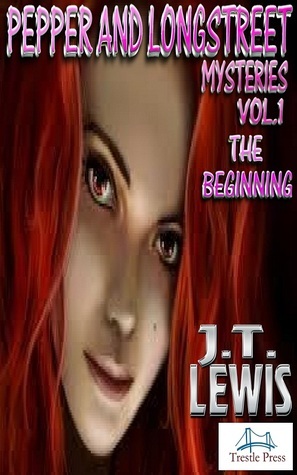 This series started out as a blog serial, and new chapters are still premiered on my blog as they appear (http://jt-lewis.blogspot.com/ ). Since I had a minute one day, I started writing a Sci-Fi serial based on something that kept bouncing around in my head, called ‘Circles’. There are two chapters of this serial on my blog now, and for now it will remain a blog serial. 2. Where do you get your ideas for writing? Funny you should ask! While most of my ideas come to me as random thoughts during any normal day, both Pepper and Longstreet and Circles evolved from dreams. Of course, they are very mysterious and rudimentary ideas when they show up like that, and I have to be quick to write them down so they don’t disappear into the either. When Pepper and Longstreet showed up in my head one morning, it was just the name, but I loved the sound of it and tried to wring the rest of the story out of my unconscious the rest of the morning. The dream concerning ‘Circles’ was essentially the actual theory that the story is based on, The Circle Theory. If you get a chance to read it, it is fairly complicated, and I spent an hour writing down everything I could remember. The next trick was to figure out how to explain it so that someone could understand it in a story. Freud would have a heyday in my head! 3. If you could meet any of your own characters, who would it be? Gabriel Celtic is my hero…and I would love to meet him in person. Like a lot of authors, my intent was to base Gabriel on myself, of course with a few more admirable attributes and many more adventures. Gabriel however quickly took on a life of his own, and as he is apt to do in the books, he did it with finesse and strength of character that I can only aspire to. 4. What would be your advice to aspiring authors? I spent many years thinking about it off and on, but never really committing to it. When I did finally start writing, I didn’t tell anyone! I didn’t want to be someone that said ‘I’m writing a book”, and then never finish it. Thinking back about it now however, it seems a silly thing to worry about. Not everything one writes is going to be good…at least not at first. But like any craft, one has to practice to master it. Long story short, my advice is to write whenever you can, as often as you can. And read! Read everything you can get your hands on, especially when it is the type of story that excites you. Finally, write a fantastic story! Editors can fix errors, Beta readers can suggest changes to make it flow, but no one can right “your” story. My underlying goal is to write an epic story, one that will pass the test of time. I’m not there yet, but I am convinced that if one works at it long and hard, that it CAN be done! In the ending of Murder!, what started out as a scene I thought should “be included” turned out to be a highly emotional scene about losing a loved one. I ended up spending the whole day writing it, exploring what my emotions would be if this happened to me. What would I feel, how would it hurt? By the time I had finished it, I was emotionally wrung out, and felt as if I had actually lived through the event myself. 6. What is something we wouldn’t know about you otherwise- strange habits, quirks? My middle name is ‘Quirky’…nuff said! Mostly, I write by the seat of the pants. Many times I see the beginning of the book in my head, and I have a general outline of where I want it to go with it, and some of the characters I want to bring in, like that. But mostly, the story comes to life as I write. 8. What do you do to help you write? Do you down the energy drinks? Eat junk food? Run around the house to get the inspiration going? Blast the tunes? Do tell. When I write however, I barely ever notice what’s playing, I guess I zone out. When I take a break or get some more coffee (a trait I share with Gabriel), I hear the song playing, maybe even sing along (badly). 9. Your office: Home, Starbucks, dining room table? Kitchen table, in front of the bow windows so I can look outside when I should be punching keys! Gabriel Celtic, an amazing detective trying to solve a spree of horrendous murders that have taken over his town. Extremely dedicated to his cause, he and his partner Frank search for clues to apprehend a new serial killer whose madness is closer to home than anyone thinks. I enjoyed this murder mystery, it had so many twists and suspects I thought I would start biting my nails wondering what was going to happen next. The suspense kept my heart in heart attack mode with the violence and horror of it all!!! Great detective work, determination and some superpowers of his own made Gabriel Celtic an amazing hero. Very well written, intriguing and kept me turning the page. J.T. Lewis’ story telling is fluidly smooth and entices you to enter a world that could easily be our own and fills you with the terror of how real it very well could be. Loved it! Thank you Alexia & JT! Very nice!